This quilted Christmas vest was made because the panel print was given to me and I was trying to clean up my stash of Christmas fabrics. I quilted the panel and a coordinating vest back fabric to a flannelette fabric that also acts as batting. Then I lined it with a coordinating print. I turned it inside out and top stitched it to keep the edges sharp and crisp. With buttons and buttonholes added, it was done. I was able to enter it in a few fall fairs where it won some first prize ribbons. Some day, someone will enjoy receiving this vest. These four runners started from a 1.5 yard piece of Border print fabric given to me by a friend. I had wanted to make a triangle type runner so it seemed the perfect opportunity. This design takes very careful cutting to get the design in precisely the right spot. I was conscious of minimizing waste fabric, so made one of the runners with the opposite orientation to take advantage of the triangle cuts. These runners look quite simple, but they are actually much more difficult than they look. It is quite fussy to get the designs to flow perfectly. The runners are quilted with a digital design called “Christmas Paisley” by Ann Bright in a neutral thread that gives texture without competing with the design. The binding is a red and green Christmas flower print that perfectly pulls out the colours in the border print. All of the binding is hand stitched. These will be handy to have ready for hostess gifts at Christmas time. Sometimes I make things just to enter in the fall fair. This was one of those times! The fair list called for a vest. This printed vest panel and coordinating lining was given to me by an Old Order Mennonite friend who had received it from someone else. My friend clearly has no use for this type of clothing. Actually, neither do I, but when the fair list called for a vest, it occurred to me that this might fit the bill! I quilted the top panel fabric to a flannelette backing with no additional batting. The quilting design is a dense snowflake pattern, which adds to the winter feel of the garment. After quilting the panel, I packed it into my project bag to take to the cottage for summer stitching. There, I trimmed it, lined it, turned it inside out, top-stitched the edges and then added the buttons and buttonholes, Voila! A completed vest! The vest did well at the fall fairs this year, winning several first place ribbons, along with a $25. gift certificate to one of my favourite sewing stores! I have no idea who will receive this vest. I doubt I could ever convince my husband he should wear this at our Christmas Eve family party! But that does not matter, I made it for the fair! Hmmm. That gives me an idea! Maybe I should donate it to the Hand-Made Table, the silent auction table at our tiny one-day fair in Northern Ontario where the proceeds go to support the operation of the fair. This simple table runner was made from the end of a bolt of printed placemats. The fabric piece had half of three placemats. I decided to even up the ends of two of them and trim the third half placemat to make a center slice that when added to the other two would make a long placemat that would become a table runner. If you look closely in this next photo, you will be able to pick out the seam lines. The strong rectangular visual line of created by the ivy wreath pulls your eye to the outside of the table runner while the diagonal quilting lines in the gold thread takes your focus away from the vertical piecing lines. It is hard to find them! Can you see the piecing lines? This table runner looks great on my island. Even though I finished the binding on Boxing Day, I am enjoying it as much as if I had been using it for the whole Christmas season! On December 24th, inspired by my friend Amy, who made a Christmas stocking for her son’s girlfriend (who is also my niece), I decided to make a new Christmas stocking for my son. Several years ago, I made matching cotton velveteen stockings for my son and daughter. He did not like the stockings and although he is normally quite accepting of whatever I make, he gently complained about the new stocking. A few days before Christmas, my daughter announced she would be bringing her boyfriend for Christmas, so I needed an extra stocking. Hence the impetus to make a new stocking. She and her boyfriend got the matching velveteen stockings and my son got the new quilted stocking. He was thrilled. It was fairly simple to make. 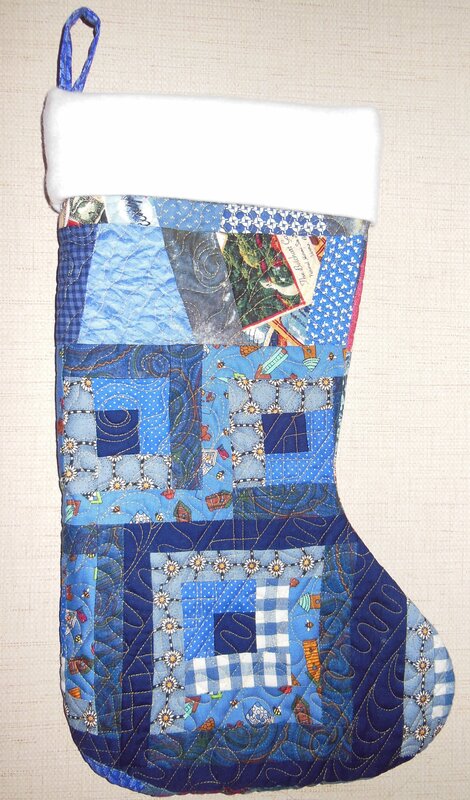 I simply joined leftover blocks and patches to the approximate size and then cut out a stocking, using the velveteen one as a pattern. I added poly batting, a bit of leftover sheeting for the backing and quilted it with freehand doodling using a thin gold Bottom Line thread. The fuzzy cuff on the stocking is a piece of white sweatshirt fleece with the fuzzy side out. Start to finish, it took about an hour. Everyone admired the stocking and my daughter has put in a request for two stockings for next year. She would like a maroon one for herself and a green one for her boyfriend. I found myself looking over potential fabrics for these stockings, so I’m sure I will be inspired to make them!